Pat Sloan is hosting a BOM called Globetrotting. You can find all the details here and when you have finished your block, please post it in the Quilt Along with Pat Sloan FB group. I had a FQ pack of Geeky Chic from Riley Blake Designs, some Moda Weave in black and clown stripe by Michael Miller. I wanted to create a funky, out there kind of block, fussy cutting the TV sets to make an interesting pattern. The block finishes at 26″ and is very easy to make. 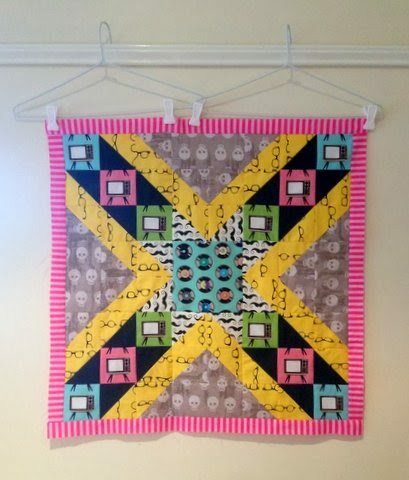 A combination of HST’s, a centre square, rectangles and a 1″ border. Pat’s instructions are wonderful (as is Pat). Oh I love this!! I'm addicted to Geekly Chic too. Always enjoy seeing blocks done with modern fabrics. Yay! Such a fun block!! Awesome fussy cutting, those TV's are the coolest! I so love what you did with this block. I have some of this fabric stashed and haven't decided what to do with it. May now have to dig it out and re-ponder. What a great block! I have to restrain myself as the list of things to do is growing like Pinocchio's nose! Love, love, love your choice of fabrics for globe trotting!! your quilt is going to be SO FANTASTIC!